Screenplay: Derek Cianfrance, Joey Curtis, Cami Delavigne. 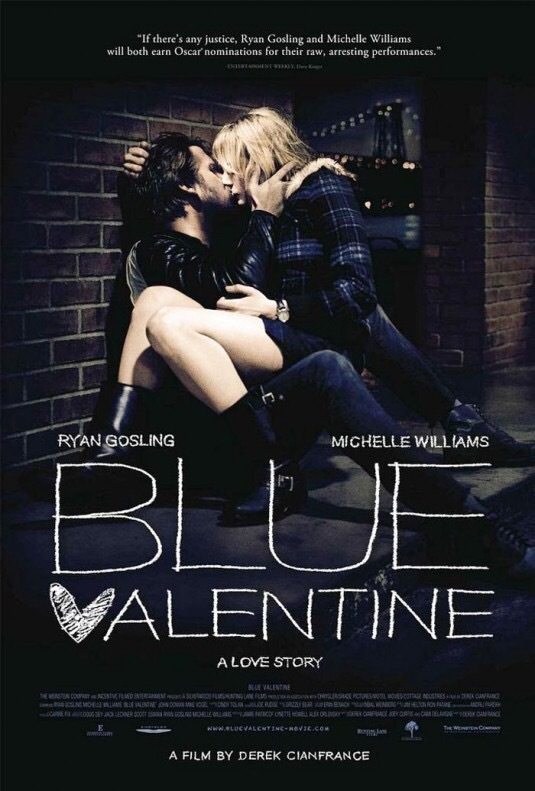 Starring: Ryan Gosling, Michelle Williams, John Doman, Faith Wladyka, Mike Vogel, Marshall Johnson, Jen Jones, Maryann Plunkett, James Benatti, Barbara Troy, Carey Westbrook, Ben Shenkman, Eileen Rosen, Enid Graham. Screenplay: Casey Affleck, Joaquin Phoenix. Starring: Joaquin Phoenix, Casey Affleck, Antony Langdon, Larry McHale, Sean Combs, Ben Stiller, Edward James Olmos, David Letterman, Tim Affleck. 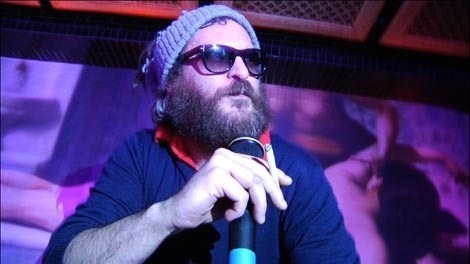 In 2008, Joaquin Phoenix announces that he’s quitting acting to pursue a music career in hip hop. 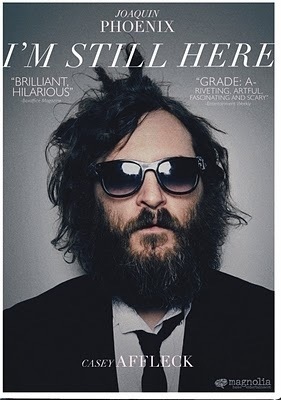 His bother-in-law, Casey Affleck, decides to film his every move over the course of a year and delivers a portrait of an artist at a crossroads in his life. Beginning with home video footage from 1981 in Panama, of a young Phoenix jumping from a waterfall, this films sets it’s stall out in exploring a life that’s seemingly always been documented. Phoenix has been in the public-eye from a very tender age, having appeared as young as 8 yrs old in the television series “Seven Brides for Seven Brothers” before moving onto “The Fall Guy”, “Hill Street Blues” and “Murder She Wrote”. His first recognisable movie roles came in the shape of 1986’s “Space Camp” or 1989’s “Parenthood” before moving into more edgier roles in Gus Van Sant’s “To Die For” in 1995. Up until then, he was better known as the younger sibling of (the late) River Phoenix but eventually gained the full respect of movie goers with two Oscar nominations (now three, since the release of this movie). It’s was through this steady rise in the film industry that brought so much media attention to his, seemingly, self destructive decision to abandon acting and become a rap artist under the guidance of Sean “P. Diddy” Combs. This fly-on-the wall documentary follows Phoenix’s obvious lack of talent for rapping and the abandonment of his personal hygiene, while his fragile mental state increased due to a voracious appetite for cannabis and cocaine. As he’s constantly high and stoned, a frenzied media where clambering for his story and a reason for the meltdown of an actor in the prime of his career. Ultimately, though, the joke was on them (and us), as the whole thing was an elaborate hoax and an exposé of the nature of celebrity and their pandered ego’s and lifestyle’s. Phoenix is entirely believable in his bearded, paunched appearance and his spiralling egotistical, mental anguish and arrogance. He even dares to tackle chat-show host David Letterman (in a now infamous episode) and when you consider that this was a role that completely consumed him – not only throughout the length of the shoot but in the eyes of the world, before and after – you realise how outstanding he is. It’s a powerful display of commitment and it’s probably one of the bravest and boldest moves that an actor has done. As entertainment, though, it’s questionable. It goes on too long and there are points where the voyeurism pushes boundaries and comes across as bad taste. What could have been the downfall of a man going through a serious mental breakdown, struggles to decide whether it’s comedic or dramatic. That being said, it’s interesting viewing and it at least exposes the bitter behaviour of western media and how easily they can turn. Being a fan of Phoenix, will certainly add to the appeal of this film, but if you can normally take or leave him, then this won’t hold much of an interest. It’s flawed, but it’s a bold and noteworthy experiment all the same. 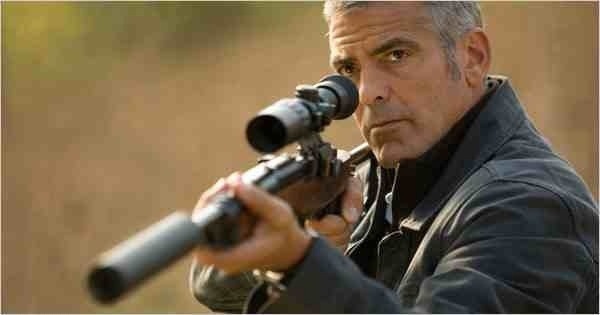 Starring: George Clooney, Paolo Bonacelli, Violante Placido, Thekla Rueten, Johan Leysen, Irina Bjorkland, Filippo Timi. He made his directorial debut with the life story of the band Joy Division’s frontman, Ian Curtis in “Control”. Now, renowned photographer Anton Corbijn shows some more control – and restraint – in his second feature, with a beautifully shot and unexpected meditative thriller. Jack (George Clooney) is a hired assassin who goes into hiding in a small Italian village to let things settle after someone tries to assassinate him. 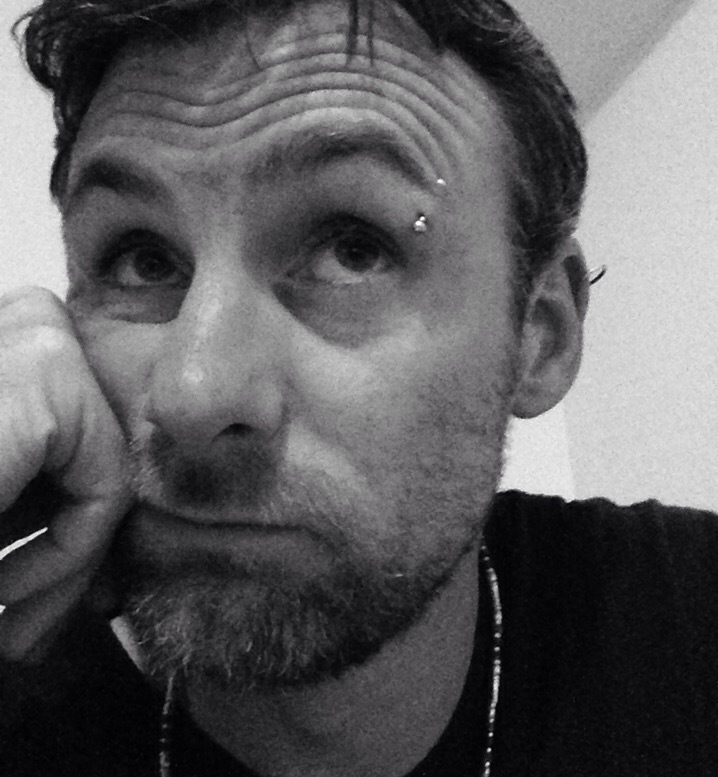 Here he befriends a priest who he very nearly confides in and also falls in love with a local prostitute. His employer, meanwhile, sets up another job for him but all is not what it seems, and his identity is more exposed than is comfortable. When a film opens with the Cloon-meister shooting an innocent woman in the back, you know things are going to be different. Although, not quite as different as what transpires. 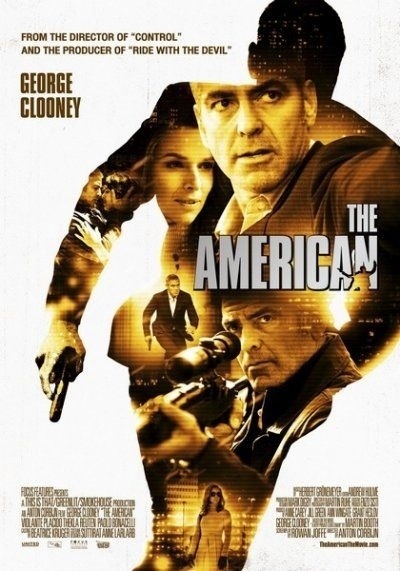 Done with a very slow, deliberate and meditative pace – reflective in the mood and existential angst of Clooney’s hitman – and as the title suggests, the only thing ‘American’ about this film, is this very character. 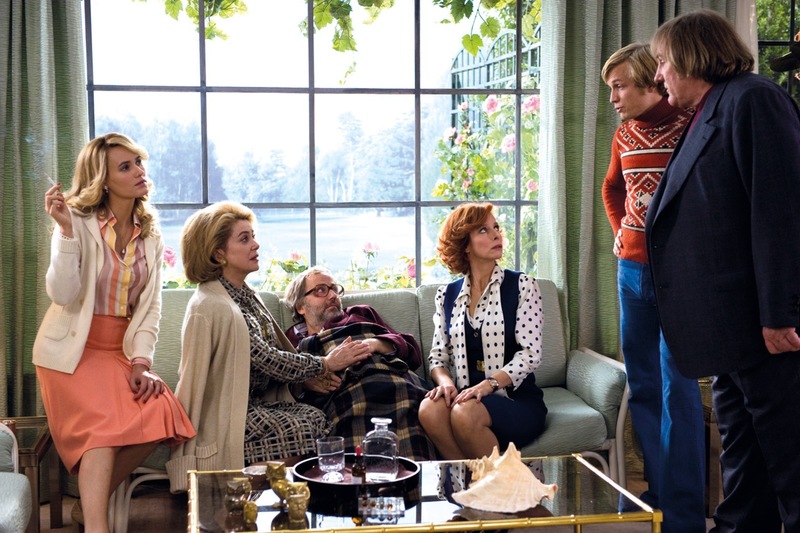 Everything else is purely European; the supporting actors, the setting, the look and feel. Its almost an art-house thriller. Emphasis on the art-house (and arduous) as there are very few thrilling moments. When they do appear though, they are impressively handled by Corbijn but ultimately the very slow pace kills the action and on a couple of occasions we are treated to scenes of almost unbearable tension and then left unfulfilled as the tension dissipates, without the expected delivery. I enjoyed the simplicity of the whole thing but also found myself wondering if it was worth the time I was investing. I admire Corbijn’s attempt at going against the formula but it wasn’t entirely successful and I couldn’t help but wonder what could have been had he concentrated a little more on his obvious ability in handling suspense and jangling nerves. However, a brilliantly understated and subtly emotive performance from George Clooney, yet again, proves his versatility and holds the film together. It doesn’t entirely excite enough for a thriller and isn’t quite as astute as a character study, but falls somewhere, awkwardly, in-between. Starring: Conor McCarron, Peter Mullan, Greg Forrest, Joe Szula, John Joe Hay, Richard Mack, Christopher Wallace, Gary Milligan, Steven Robertson, David McKay, Stephen McCole, Gary Lewis. Following up the quality of “The Magdalene Sisters” was always going to be difficult for writer/director Peter Mullan and although he achieves a similiar hard-hitting authenticity with “Neds” and delivers an impressive retelling of youthful gang culture, he gets himself caught up in some artistic flourishes that don’t quite gel with the stark accomplishment on-screen. Glasgow, Scotland, 1973; the streets are filled with knife-wielding youths. Caught in the middle, is promising and aspiring teenager John McGill (Conor McCarron). He’s a bright and ambitious lad that’s held back by his alcoholic father (Peter Mullan) and the terrifying legend of his older brother (Joe Szula), who he feels the need to live up to. Peer pressure and a lack of chances in life, turn the young McGill feral. So much so, that his brooding anger surfaces to point of bloody violence, leaving him very little hope in achieving anything that he was fully capable of. Having grown up in Glasgow, himself, Peter Mullan knows the time, the people and the city very well. This, undoubtedly, comes across in his choice of music, his eye for the style of the 70′s and his brilliant and effective use of Glasgow locations. He also assembles an impressive cast of young, unknown Scottish actors who deliver natural, colloquial, dialogue and excellent performances. 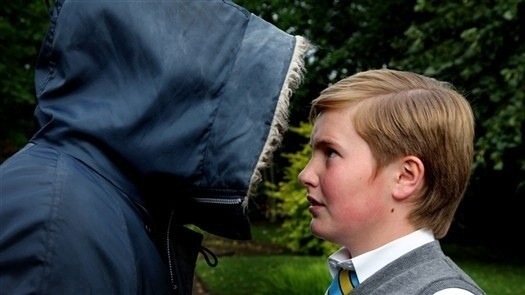 Myself, being a working-class Glaswegian, could identify with these characters, their behaviour and the politics of gang culture and can confirm that this is an astute portrait of a very real problem that still exists in Glasgow today. For that reason, Mullan has to be given kudos in not only achieving such authenticity, but by delivering it so vividly. Respected directors such as, Ken Loach and Mike Leigh, have made a name for themselves with similar ‘kitchen-sink’ dramas and Mullan’s efforts here, command a similar respect. However, despite the realism and attention to detail, Mullan makes the same mistake he did with “Orphans” and injects it with surreal moments – like visions of Christ – that don’t contribute anything positively to the story. It’s understandable why he’d make allusions to the power, manipulation and guilt that comes with a Catholic upbringing in a city like Glasgow – where there is a big religious divide – but they just seem as if they belong elsewhere. These moments are sporadic, buy they’re still jarring enough to make you believe that this is a director serving some egotistical delusion of his own artistic merit. Whereas, he could be concentrating on the very thing that he knows so well. The film has a lot going for it in terms of it’s accurate portrayal of these times but as it draws to it’s conclusion and the unsure progression of the main character, the film ends rather ridiculously, not really knowing how to end. Mullan’s attempt at profundity falls flat, but as a portrayal of Glasgow gang culture it’s very observant and accurate. It’s just a shame that he didn’t really know how to tie things up and delivers an ending that didn’t have the distinct aroma of desperation. 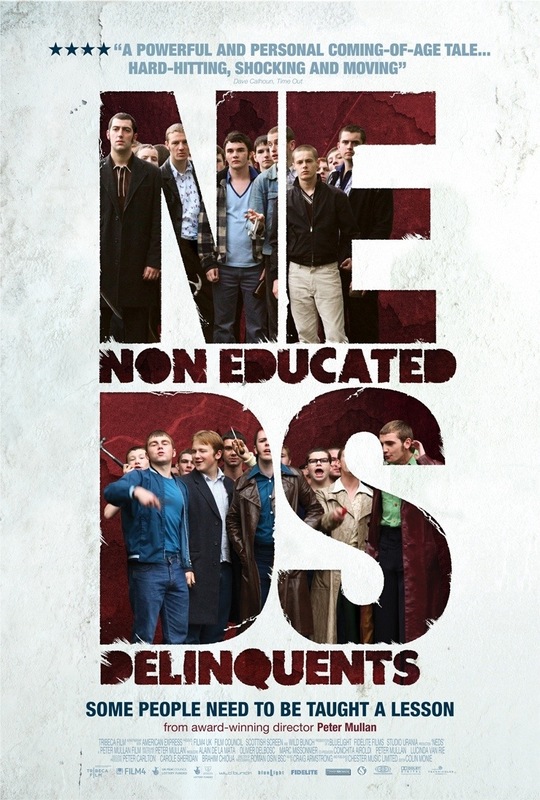 (For the record – and those that missed the poster above – NEDS is an abbreviation of ‘Non Educated Delinquents’. It’s the common term for the violent and anti-social youth in Scotland). Starring: Adrien Brody, Forest Whitaker, Cam Gigandet, Clifton Collins Jr., Ethan Cohn, Fisher Stevens, Travis Fimmel, Lavell “David Banner” Crump, Jason Lew, Damien Leake, Maggie Grace. Once again, a brilliant foreign language movie (“Das Experiment“) is given an English language remake and once again, it fails to do the original justice in any shape or form. 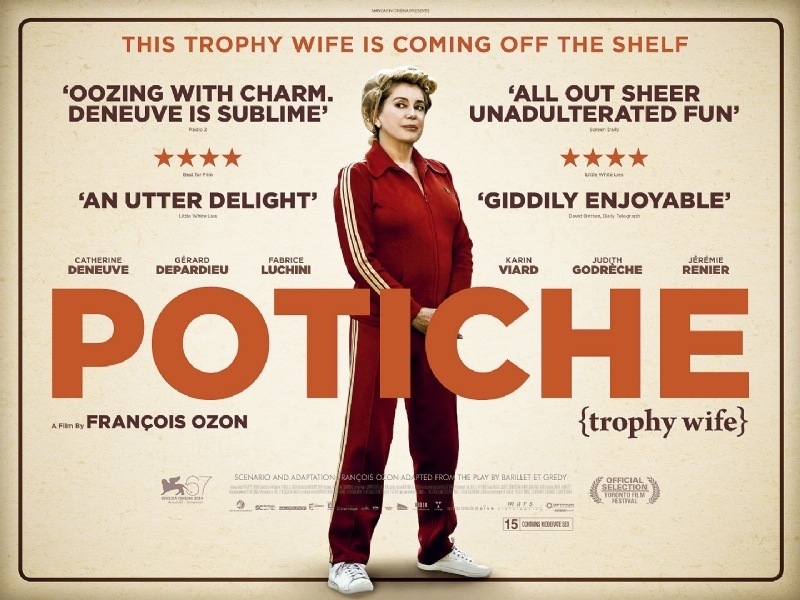 If any positives are to be taken from this, then a major one would be it serving as a reminder of how good director Olivier Hirschbeigel’s 2001 German film was. 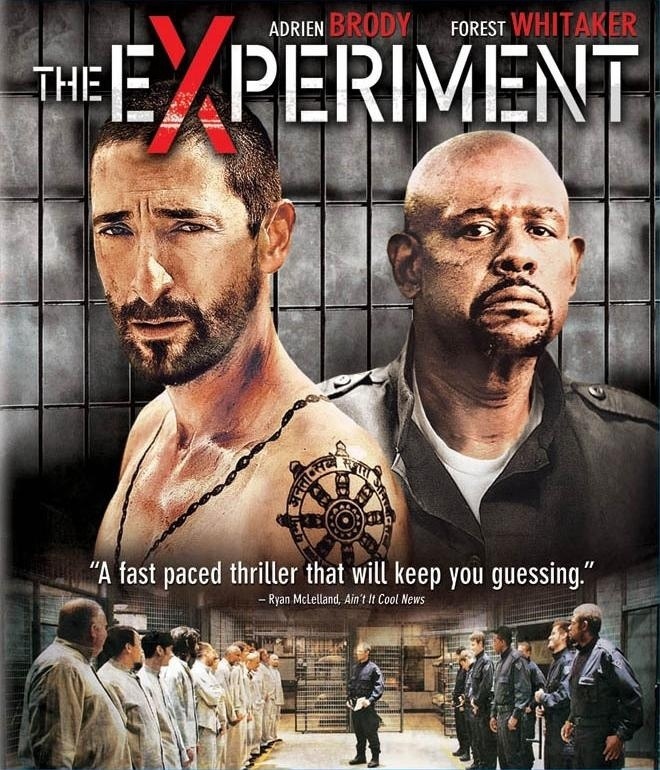 Strapped for cash in order to travel to India with his girlfriend (Maggie Grace), gentle mannered political activist Travis (Adrian Brody) decides to take part in a behavioural psychological experiment whereby 20 or so men are chosen to live in a makeshift prison for two weeks. Each of them will assume either the role of guard or inmate but once the doors are locked and they are left to their own devices, things begin to spiral out of control. The fact that this went straight to the DVD shelf when released says it all really. From the offset there are shades of a made for television appearance. 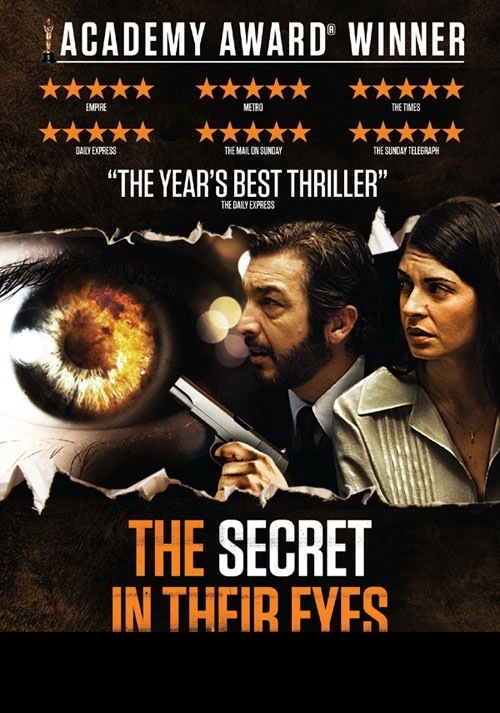 This doesn’t last for the entirety of the film but the standards don’t rise very far above it and the voyeuristic nature of the story will appeal to fans of reality TV shows like “Big Brother“. It’s strengths, unsurprisingly, lie in the performances; Brody is an excellent leading presence and fine support is delivered by a towering Forest Whitaker but the inclusion of Maggie Grace’s love interest is entirely unnecessary, adding little to no substance to the film and could have been completely dropped without it making any difference whatsoever. In retrospect, it’s a lazily written script that’s the films biggest downfall. Where the original instilled a sense of realism, this version just seems staged. The premise is still thoroughly intriguing though and all the more so, with the knowledge that it was based on a real experiment that took place in 1971 at Stanford University before it all got out of hand. It’s decent enough to pass an hour an half of your time but don’t expect anything special. It’s the performances that make it worthwhile but overall, it’s just another example of a completely unnecessary remake. If anyone is unfamiliar with the events or the original German film then this film will go down nicely. However, it’d be wise to seek out Hirschbeigel’s version instead.